News related to G.I. Joe and the world of video gaming. 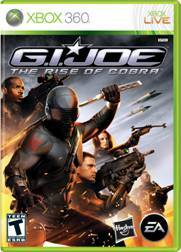 EA’s “Rise of Cobra” movie tie-in game reviewed! It’s been a long time since I’ve been able to say this but I’ve posted a new review here at JBL. Read the review and find out! It’s the first of many reviews to hit in the coming weeks. EA Games launches “Rise of Cobra” website! Today G.I. JOE fans worldwide can head to the recently launched G.I. JOE The Rise of Cobra The Game community web site to declare their allegiance in the epic battle of G.I. JOE and COBRA and set up a “base of operations” to get all the latest news and information on the upcoming video game. Users can share battle strategies and talk about the game on the EA forums, visit the official G.I. JOE The Rise of Cobra movie site, sign up for the G.I. JOE The Rise of Cobra newsletter to get classified intelligence in real time, get their own G.I. JOE or COBRA badge to show their allegiance on Facebook and MySpace, and battle ninjas and defend their base from COBRA in G.I. JOE mini-games (coming soon). Fans will also be able to declare their allegiance to G.I. JOE or COBRA by using the site’s faction switcher to customize their G.I. JOE experience while browsing. G.I. JOE and COBRA operatives who choose to download certain “intel files” from the site will even be awarded with a secret access code to unlock additional top-secret G.I. JOE downloadable content! The new G.I. JOE The Rise of Cobra community web site is now live at www.GIJOE.EA.com. New daily wallpapers from EA’s “Rise of Cobra” game! Feel that your desktop is caught in a rut? Do you suffer from “wallpaper ADD” and change your background 3x a day? The good folks at EA can help! Check out EA’s “Daily Download” featuring images from the forthcoming arcade-style G.I. Joe: The Rise of Cobra game! Found these at TRUs’ R Zone. They are done by GamerGraffix. If you weren’t at E3 2009 this year and missed the debut of EA’s latest G.I. Joe: Rise of Cobra game trailer, don’t fret! The good folks over at Team Xbox have the trailer available in both standard and high definition versions. E3: Hands-on review of “Rise of Cobra” game! IGN.com’s Greg Miller was treated to a “hand’s on” preview of EA’s forthcoming “Rise of Cobra” movie tie-in game. June 2, 2009 – Back in March, G.I. Joe superfan Hilary Goldstein sat down and cranked out a lengthy GDC preview all about G.I. Joe: The Rise of Cobra. Hil covered how many playable characters are in the game (12 with an additional four unlockable Cobra guys), when it’s set in the timeline (after the upcoming movie), and the fact that there’s two-player co-op (but it’s not online). Now, three months later, you’ve got me — admitted G.I. Joe noob Greg Miller. The only thing I really have to add to this IGN goldmine of G.I. Joe knowledge is some hands-on impressions, so let’s get to it, eh? Now, he won’t confuse his backpack with the other backpacks. If you’re just joining us, go read Hil’s preview, but if you’re too lazy to do that, G.I. Joe is an arcadey action game in the vein of Wolf of the Battlefield: Commando 3 and Assault Heroes. Two Joes start a level and begin mowing everything down that is in their way. Hack and slash, run and gun, it’s whatever you want to call it. You can take cover, pick up power-ups, and more, but the whole point is to just kill everyone in your way and blow up any barrels you run into. Now, there is a bit of strategy to it. For my demo — just like Hil’s — it was Storm Shadow and Heavy Duty leading the fight. Storm Shadow could attack a bad guy with his swords, kick the foe into the air, and let me (as Heavy Duty) blast the enemy with my gatling gun. The whole time we were wailing on the bad guys and strafing around the jungle scene, we were racking up massive points and multipliers. Getting the best score is the whole point of G.I. Joe, and getting the most out of your multiplier means you need to keep killing stuff and stay alive. Health is represented by a three-part triangle and will regenerate if you can get out of an enemy’s way. Really, that’s all there is to say about Joe. You just go through the levels mowing everything down. If you’re playing by yourself, you can switch characters at anytime while tackling the game’s three difficulties; there are going to be 20 missions with about two to five sections in each mission; and dialogue pops up in text boxes with the speaking character’s image (there are no voices for the conversations). Back when Hil wrote about Joe, he said the game wasn’t looking on track to becoming a game of the year contender. I agree with that sentiment and am willing to take it a step further and tell you I’m a bit worried about how the final product is going to shape up. The graphics look kind of rough, the gameplay seemed a bit repetitive, and it just didn’t strike me as all that much fun. However, this is a preview so there’s plenty of time for those issues to get amended and you need to remember I have no vested interest in the G.I. Joe franchise. Game Trailers.com has the RoC Game Trailer online. Here are some links to the RoC Video Game from EA. Check these out! Windows Media, Quicktime. “Rise of Cobra” video game art revealed! G.I. JOE fans worldwide have a reason to get excited today as EA unveils the packaging design for its upcoming action-arcade shooter game G.I. JOE The Rise of Cobra. The console platforms feature a lineup of 16 playable characters – four of which are unlockable COBRA characters – and pick up where the movie leaves off with an all-new storyline and plenty of action. Aspiring G.I. JOE fans can experience G.I. JOE like never before with the Nintendo DS version, which includes 11 playable characters, unique top down gameplay and up to four player G.I. JOE versus COBRA multiplayer modes. G.I. JOE The Rise of Cobra hits stores this August, and will be available for the Nintendo DS, Xbox 360, PlayStation 3, PlayStation 2, PlayStation Portable (PSP), and Wii.